In an interview, Brandon Thomas, the writer for the comic book Noble, said, "My biggest challenge every month is coming up with a better, more exciting action scene than the one we delivered in the previous issue." So far, so good. He hasn't disappointed. An early image from Noble #1 shows David Powell, the protagonist, in handcuffs as a military-like force of men try to "lock him the hell down!" But he refuses to be chained, and we're treated to this radiant, two-page spread of David breaking the chains, demanding that the soldiers get "OFF ME!" and those would-be captors falling backward. I've read Noble issues #1 - #3. Thomas, illustrator Roger Robinson, colorist Juan Fernandez, and letterer Saida Temofonte have done really powerful work. For my day job, I teach African American literature, and in that world, the mention of "a story" usually refers to a narrative comprised exclusively of words. Noble is different, as we're regularly reading colorful scenes with dramatically lettered words like "KRAK," "BAM," and "VOOOOOOooom" to signal loud, vivid sounds that correspond to the action. Sure comic books are supposed to be like that, but you'd be surprised how often words and conventional, prose narratives take over. Thomas is clearly writing, but much of what he's doing concerns orchestration and collaboration work with Robinson, Fernandez, and Temofonte. David Powell has lost his memory, and he going through the process of understanding his super-powers. He's on the run and moving around different places, including Argentina and Bolivia, trying to keep a low profile as this mysterious group pursues him. David's wife Astrid is trying to locate and assist her husband as well. Thomas uses minimal words to communicate those plot details. Instead, he draws on the support of his team of artists to materialize the story. 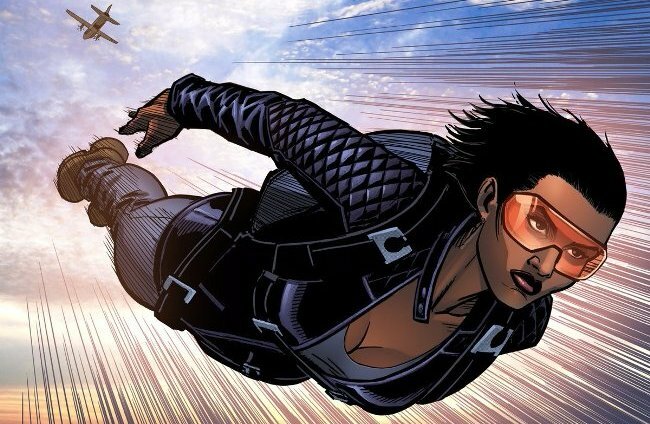 In Noble #2, we see Astrid soaring through the air, as she jumps and parachutes from a plane. Words don't tell us that we're dealing with a special black woman character. We see it. In this issue, David is confronted by a street gang in Bolivia, and his dramatic confrontation with them is situated between panels showing Astrid interviewing people about her husband in Argentina. That kind of varied yet fluid juxtaposition represents a group of artists showcasing the unique characteristics of the comic book medium. "KAWHOOMP." "SWAKK." ""KRAKK." "WHAMM." "KISSH." Those are the vividly lettered sound effects that Temofonte attaches to a battle scene in the opening pages of Noble #3, where David is fighting off doctors and security personnel who try to subdue him. Fernandez colors these red and orange-ish backgrounds to highlight the intensity of these dramatic moments drawn by Robinson. Can Noble really keep this up? Can the book meet Thomas's self-imposed challenge of coming up with such intricate, exciting action scenes each month? I'm interested to see.